When The Libertines imploded (first time round) they created an opening in this country into which many an indie-rock artist has since piled. Emerging from the provinces and capital alike, these purveyors of various strands of guitar pop, post-punk and garage-rock music have stretched from Arctic Monkeys to Palma Violets and from Miles Kane to The Vaccines. For the most part they ditched the shambolic efforts of Pete Doherty and Carl Barât, replacing the ramshackle with the more refined and chaos with a quirky charm. 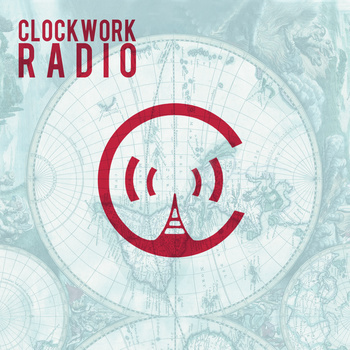 Following in those broad footsteps have been Clockwork Radio. Starting out in north Wales some seven years ago, the current line-up of founding member Rich Williams (guitar and vocals), Dan Wiebe (vocals and percussion), Sam Quinn (vocals, bass and rhodes) and Iwan Jones (lead guitar and vocals) has been together since 2010. Now based in Manchester, the band has released four EPs in the interim whilst forging for themselves a strong live reputation across Europe. Now comes their debut album No Man Is An Island. Recorded over a 48 hour period last December in Manchester’s 80 Hertz studios, the end product reflects that time-restricted process and all the urgency and vitality of their live shows. There are fast tunes; there are slow tunes. There are toe-tapping pop jewels (‘Fever’ and ‘Tacenda’), an arms-aloft, fist-pumping, would-be festival anthem (‘Feel It Up’), a gorgeous cell-phone-in-the-air ballad (‘Moonstruck’), complete with some quite excellent fuzz-tone guitar, and a blistering rocker (‘Sitting Bull’). No Man Is An Island will draw almost inevitable comparisons between Clockwork Radio and early Arctic Monkeys. Whilst the Manchester band’s lyrical observations do not plough the same sardonic furrow as Alex Turner, there are marked similarities between Rich Williams’ expressive voice and that of the Arctic Monkeys’ frontman. The core elements of their songs also share certain characteristics with those of Sheffield’s finest – crackling, chiming guitars, exquisite harmonies and a deep love of the wistful pop tune. Yet for all of these likenesses, No Man Is An Island firmly attests that there is much more to Clockwork Radio than just being mere indie-copyists.